This post is about music, squatting and reclaiming our city. It’s partly been inspired by Richard Dudanski’s book Squat City Rocks: Proto-punk and Beyond, which I read just before Christmas. Dudanksi was drummer for the 101ers, an energetic rockabilly-flavoured band based in the squats of 1970s West London. They are most known as a precursor to the Clash, with Joe Strummer (aka Woody Mellor) at the helm. I have a lot of rock n roll biographies on my list of want-to-reads: Richard Hell, Jah Wobble, a guy from the Pogues… So far I’ve read Patti Smith’s Just Kids and Viv Albertine’s Clothes Clothes Clothes. Music Music Music. Boys Boys Boys. I came across Dundanski’s book by accident, and it’s a happy one. As expected, Squat City Rocks visits some of the places and people in Viv Albertine’s book. Drummer Dundanski could’ve been in the Clash, but he hated manager Bernie Rhodes so much he decided to carry on without Joe and work on his own musical projects. He went on to play with Public Image, Basement 5, the Raincoats and other bands. This book, however, focuses most on the 101ers, the West London squatting scene of the late 70s and his sometimes strained but enduring friendship with Joe Strummer. This book is apparently self-published, based on Richard’s blog. I’m glad it’s seen the light of day. Dudanski does not write with the poetry of Patti Smith or the spikiness and bite of Viv Albertine, but he writes from the heart and evokes a time and place very well. 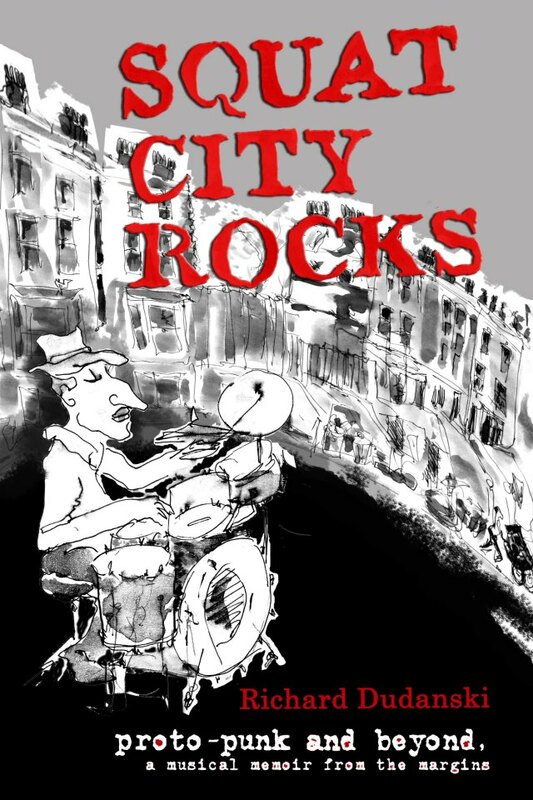 Squat City Rocks was pleasure to read, further enhanced by Esperanza Romero’s illustrations. The 101ers were before my time, but when I first came to London I met friends who had gone to their gigs often. Some preferred them to the Clash. I wouldn’t agree with that myself, but no doubt we wouldn’t have the Clash without the 101ers. My thoug hts returned to this book several times over the holiday period, when a squat on Charing Cross Road was set up to feed the homeless – and it was promptly evicted. Much of the creative activity Dudanski describes had its basis in squatting – people could live cheaply and communally in big old houses, they were able to make space for studios and rehearsals and gigs. He doesn’t glamourise life in these communities; there’s no shying away from showing violence from police and unsympathetic neighbours, as well as tensions within households. He pulls no punches about the hard work it often takes to turn a derelict property into a home. But squatting housed many homeless people, resulted in creative movements and projects, and changed lives and neighbourhoods for the better. The squats around Elgin Avenue have now become permanent social housing due to the campaigns of Walterton and Elgin Community Homes. Many more examples like this can be found in the exhibition Made Possible by Squatting. Squatting in residential properties has already been outlawed. Tory and Labour politicians such as Chuka Umunna and Lib Peck have urged the same for commercial properties. Let’s fight this tooth and nail! Meanwhile, I watched the 75-minute documentary on the Clash’s New Year’s Day gig in 1977, which was shown on the BBC4. A rich portrayal of London in the 1970s, this programme was about much more than a gig and a band. It showed a London where large sections were semi-derelict and battles raged between communities and speculators over what would happen to them. I was particularly fascinated with its depiction of Covent Garden, the site of the Roxy club where the Clash and other early punk bands played. When the Covent Garden fruit and veg market shut down 1973, the area became a wasteland full of empty buildings and gaping holes where buildings had been torn down. It was the first significant area faced with the kind of gentrification we know and fight today. After the departure of the market, the GLC adopted a masterplan that would have turned the whole area into a series of indoor malls and covered walkways and drive out the current residents, including people who had worked at the market and in the theatres. 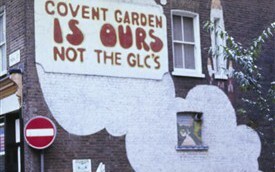 The website Covent Garden Memories tells more about this; you can also watch The Battle for Covent Garden. I lived in this area myself when I first came to London, joining a large squat that took up the corner of James St and Long Acre, just across from the tube station. I remember the hoardings around empty lots, full of flyposting for punk gigs. Later some of these places were turned into community gardens. I attended a festival there one summer. A Woman’s Place, one of London’s first feminist bookshops and social centres, was also based in a squat in Earlham St.
Other central London squats of the time included Trentishoe Mansions on Cambridge Circus and Huntley Street in Bloomsbury. 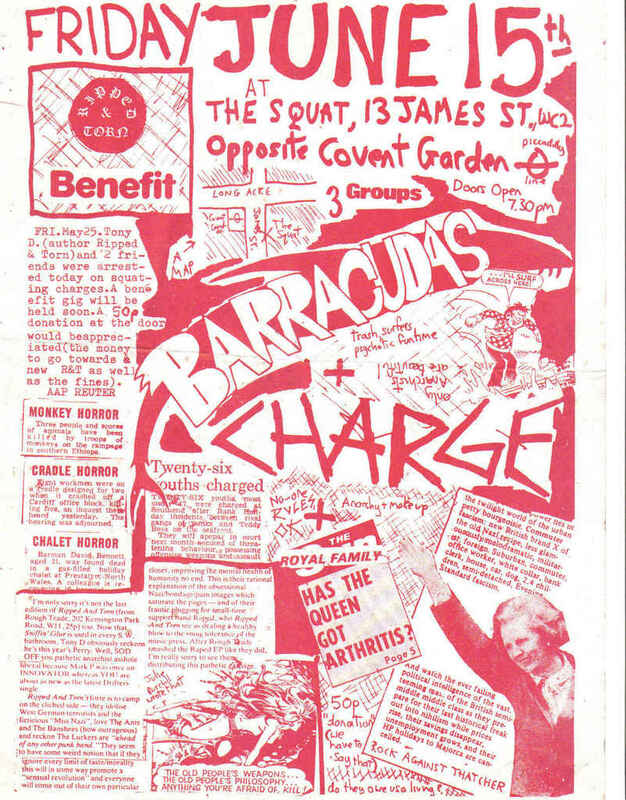 There were also squats in Scala Street (home of the original Scala Cinema) and Burton Street (home of the Pogues). This post was originally meant to end around 1977. However, delay plus recent events have caused it to grow ever longer. So let’s leap forward to 31 January 2015 when I took part in the March for Homes. Issues around the ownership of cities, social cleansing and the need to take over and transform space return with a vengeance. It was a miserable mucky day and I was tempted to turn around and go home as the South London feeder march assembled. But I’m glad I stuck around – there was a good energetic turn-out despite the rain and cold and the occasional cutting piece of sleet. As we marched from the Elephant to the Greater London Authority headquarters at Tower Bridge, we passed through torn-up streets and dangling cranes and all the debris of a city ripped up and tranforming into an alien place meant only for the rich. We also passed through a diverse collection of council estates – red-brick, high-rises, maisonettes, you name it – where fellow tenants came out to cheer us on. Once the South London and North London marches joined forces at Tower Bridge the crowed swelled to at least 5000. Not bad for a cold and rainy Saturday, for a march taking on the unglamorous but vital issue of affordable housing. My friend Andrea Gibbons has a great selection of photos here. There is a community assembly every day at 6.30pm, where “all neighbours and friendly visitors are warmly invited”. This takes place at 105 Chartridge, Westmoreland Road, SE17. You can find a map here. So maybe I’ll see some of you over there!